This is a great recipe to make in winter when organic local lemons from Eze and organic oranges are available in our supermarket in Nice. Fresh whole sea bream, daurade, is used in the recipe but it works well with any fresh whole white fish. Ask your fish monger to clean and descale the fish. Preheat the oven to 200°C, roast. Wash the orange and lemon and cut them into thin slices. Place 1 tbsp. minced parsley and a pinch of salt, if you wish, in the cavity of each sea bream. Then fill the cavities with some lemon and orange slices. Place the sea bream in an oven- proof dish and divide the rest of the lemon and orange slices on top of the fish. Sprinkle 2 tbsp. olive oil over the fish. Roast in 200°C for about 30 minutes depending on the size of the sea bream. Test that the fish is done by making a deep cut with a sharp knife or by looking inside the fish. The fish is cooked when it is opaque. Serve with steamed new potatoes and some wilted spinach or chard. This simple recipe needs quality ingredients: organic chicken thighs, fresh sage leaves, and a sprig of fresh rosemary. Push the sage leaves under the chicken skin. Warm the olive oil in a heavy casserole over medium heat and fry the chicken thighs on both sides until golden. Chop the onion and mince the garlic clove and add to the casserole. Continue cooking for about 5 minutes. Pour in the wine and chicken stock, add the rosemary and black pepper. Cover and simmer for 45 minutes. When the chicken is done remove the thighs from the casserole and keep warm. Strain the cooking liquid remaining in the casserole through a sieve and turn the heat very low. Whisk together the egg yolk and lemon juice, and keeping the heat very low gradually add to the casserole whisking all the time. This will thicken the sauce. Divide the chicken thighs and the sauce on the plates. Serve with green lentils or microwaved new potatoes and microwaved butternut squash cubes or broccoli. Decorate with parsley. The mythic ridge of the Sainte-Baume Massif about 20 km from the Mediterranean Sea as the crow flies offers great views and extraordinary hiking. But the greatest attraction in this area is Maria Magdalena’s cave and the rather sombre chapels that were built around it. According to the legend, Maria Magdalena arrived first to Marseille and then to this remote cave where she lived for several years. We started our hike from the Hôtellerie of Sainte-Baume (670 m), following the GR 9 trail which took us past a field before it dove into a magnificent forest (Foret Domaniale de la Sainte-Baume). We ascended along a wide trail to a crossroads where we forked right, making a detour to the cave and the chapels. After the visit, we descended back a bit to follow the GR9 trail and ascended along it to Col du St-Pilon (953 m) on the ridge of the Sainte-Baume Massif. From here, the GR 9 trail runs to the east, following the ridge whereas to western part is marked as GR 98. We forked left as we had planned, ascending gently in a barren and rocky terrain. The trail was very well marked with white/red signs. The highest point of the ridge (1148 m) is in fact shared by two summits: Jouc de l’Aigle and Signal des Béguines, about 1,5 km further east. From Col du St-Pilon, the ascent to Jouc de l’Aigle was only about 200 m. Just before the summit, some easy scramble was needed. A cross was erected on the summit. In spite of the haze, we saw Mont Sainte-Victoire in the northwest and the Mediterranean Sea in the south. We used the same trail back as far as to the crossroads below the cave. 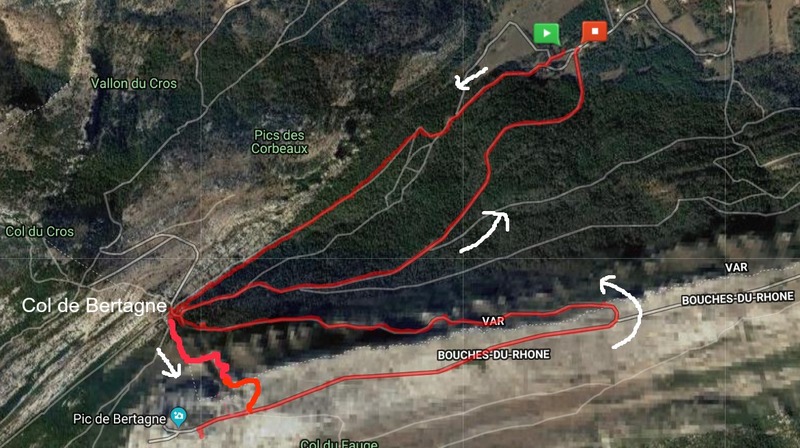 Here we took the wide right-hand trail which descended in the forest to “Trois Chenes”, then headed back to our starting point less than a km away. This is a magnificent hike in the red Esterel Mountains offering great views to the Mediterranean Sea. We did this hike on a warm February Sunday. It also happened to be during school holidays and the trail was extremely popular. The soil and rock of the Esterel Massif is of volcanic origin, hence the peculiar red terracotta colour. The hike we did ran inside Réserve Biologique de l’Esterel in the southernmost part of the massif in the Var Department. 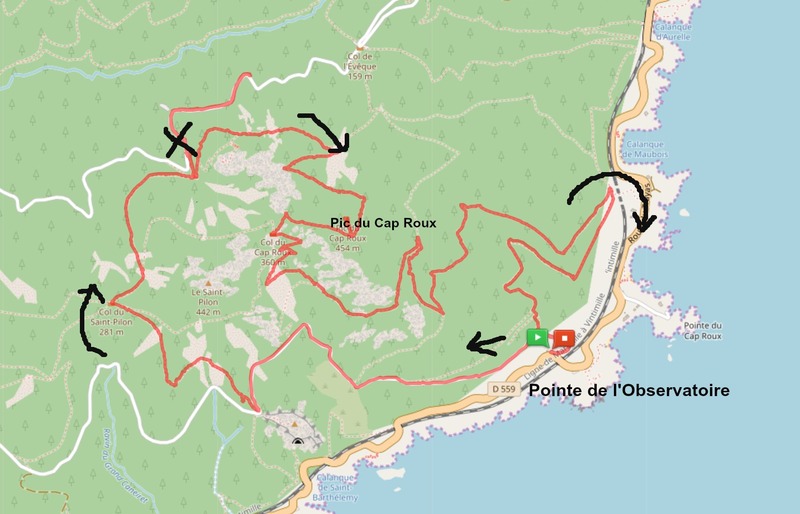 We planned a loop hike with Pic du Cap Roux (453 m) as the highest point. We started the hike from the parking called La Pointe de l’Observatoire on the D559 road between Theoule-sur-Mer and Agay. We first ascended along a paved road about 2 km (closed for regular traffic) as far as to Rocher St-Barthélémy. Here we exited the forest road, hit the trail proper and ascended along it to Col du Saint-Pilon. We then descended to Sainte-Baume where we passed a water source and started a long ascent along the northern flank of the mountain, passing the short side trail to a chapel. 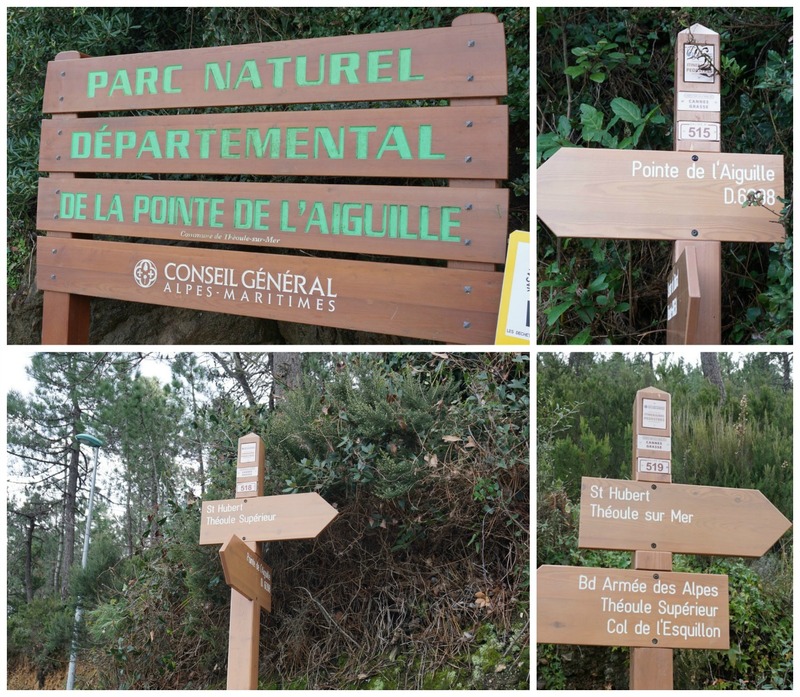 Note that compared with most trails in Alpes-Maritimes, signposts here were sporadic or non-existent but the trails were marked with yellow and/or blue. So, we first missed the ascent from Sainte-Baume. We reached the crossroads just under the summit of Pic du Cap Roux, climbed up to admire the views. The day was clear, but some coastal fog started to form during our picnic on the top, making the visibility somewhat reduced. We then descended to Col du Cap Roux. Here we forked left, following the yellow-marked trail. At the next crossroads we again forked left (yellow signs, no signposts). 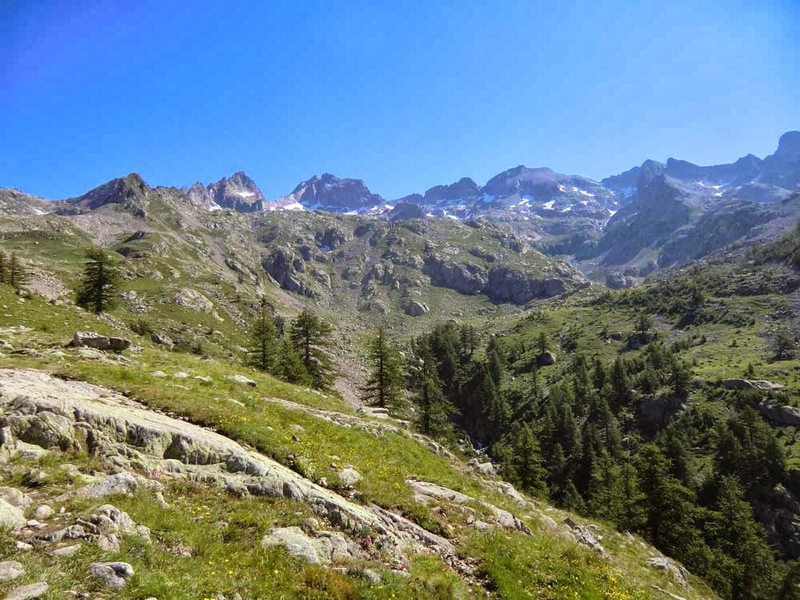 We continued along the trail that ran in the southern incline of the massif, with the Med in sight. We forked left for the third time at the next crossroads, crossing a valley. At one point we thought we might end up too much east but no worries: we eventually reached a wider path not far from the main coastal road and the railroad, turned almost 180°, and headed southwest. We crossed the above-mentioned valley again, now lower, and soon reached our starting point. Our GPS track in shown below. Just ignore the small marked detour at Sainte-Baume! Recently the local newspaper, Nice Matin, wrote about a 24-year old talented chef from Nice, Julia Sedefdjian, who only a year after opening her restaurant Baieta in Paris got a Michelin star. The menu in her restaurant reflects her roots in Nice. One of the dishes is her version of bouillabaisse; steamed fish served with sauce niçoise. But what is sauce niçoise? Julia’s recipe is of course her secret so I googled sauce niçoise and it seems that there are several versions with different vegetables. I tried and modified different French recipes and settled with the following recipe which I think goes best with white fish fillets and at the same time reflects the choice of typical ingredients here in Nice. By all means add some seafood to your choice of baked or steamed white fish fillets if you wish your dish reflect more bouillabaisse. You can also use more anchovy fillets if you like. I used them sparingly because I didn’t want them to overpower the delicate taste of fletan, halibut, which was my choice of fish. Serve your fish with some greens and new potatoes, lentils or grains. In the photo, the fish is served with wilted spinach and panisses, local chickpea cakes. Dip the tomatoes into boiling water for 1- 2 minutes, then peel and coarsely chop them. In a small casserole, warm olive oil over medium- low heat. Peel and chop the shallot and peel and mince the garlic. Add them to the casserole and sauté for 10 minutes. Add the tomatoes, anchovies, olives, and black pepper. You can first soak the anchovies in water for 10 minutes to reduce the amount of salt in them. Let all the ingredients simmer for 5 minutes. With a hand-held mixer, purée the sauce. It will be quite thick, you can add 1- 2 tbsp. of boiling water if you wish. Place the fish on the plates and divide the sauce around it. Théoule-sur-Mer (36 km from Nice) is a small coastal town between Mandelieu-La Napoule and Miramar. The landscape here is already more provençale and the Esterel mountains with their typical red colours add a special spice to the surroundings. This easy walk called Circuit d’Aguille starts from the Esplanade of Charles de Gaulle in the town centre. We walked along the paved promenade Pradayrol to Plage de l’Aguille where the trail forked uphill. We first ascended to signpost #515 and then descended to Pointe de l’Aguille. 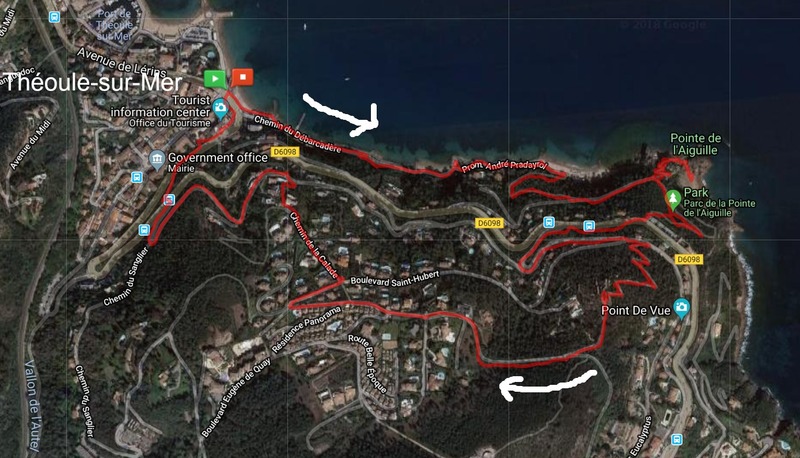 After admiring the magnificent pebble beach of Gardanne we took the same path back, continued to the coastal road RD6098, turned right, and followed it about 100 m. We then forked left and continued along rue de l’Allée des Pins then rue A.Ballif. At signpost #518 (pointing to St Hubert, Théoule Supérieur) we forked right and followed another good trail to the highest point of this walk. Best views were to the north and east (The Napoule Bay and Cannes). The trail continued towards St Hubert above Théoule-sur-Mer, and we soon reached paved streets. We took Chemin de la Calade (steep stairs down), crossed the main RD 6098 road again before reaching our starting point.